The only female fight involving an Asian this past weekend saw Russian Natalia Smirnova (7-0, 4) scoring a dominant victory over the over-matched, though incredibly game, Hana Horakova (3-10). Fighting in Rostov-na-Donu Smirnova took control of the bout early and was never really challenged by the out classed Horakova who struggled to take take just a single round on two of the three cards. At the DK Moskovsk in Russia fans got to see the professional debut of Ukrainian Nadezhda Khaenok (1-0) who made an impressive start to her professional career as she defeated Russian Viktoriya Aleksandrova (0-1). Unfortunately the fans in attendance would likely have preferred a victory for Aleksandrova though she was thoroughly out classed and shut out over the 4 round distance. 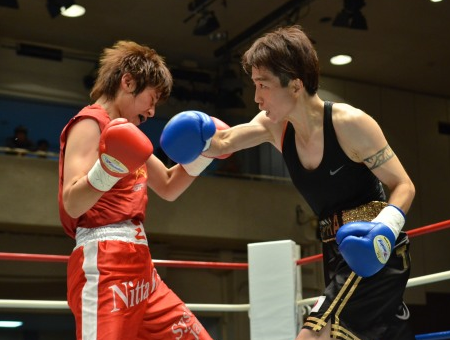 On Sunday Japanese boxing fans at the Daihatsu Kyushu Arena saw the debuting Kana Fukuda (1-0) get off to the perfect start in her career as she scored a 4 round decision against 23 year old novice Yuma Kaino (0-2). Female action returned to Thailand earlier this week as part of a 5 fight show in the Ban Rai Temple. The lesser of two female bouts saw the experienced Thai Kanittha Kokietgym (20-5, 7) taking a decision over the debuting Ngamta Kwanjaisrikot (0-1) in what was, at least on paper a massive mismatch. With Kanittha having previously fought for the WBC female Minimumweight title, and putting up a half decent effort against Japan's Naoko Fujioka, who was defending her belt for the first time, this really was about "levels". Ngamta may have seen out the final bell but don't be confused about the winner. The more important of the two female bouts saw the destructive Rika Matsumoto (5-0, 5) claiming not just her 5th straight stoppage victory but also her first title. Matsumoto, facing off against win less Thai Lamnammoon Kwanjaisrikort (0-5) needed just 2 rounds to finish off the bout and claim the WBC Asian Boxing Council female Light Flyweight title. Prior to this bout Matsumoto had defeated 4 debutants. We now hope she will be facing a fighter with a victory on their record next time out as she looked to build her record. There is talent there in the Thai based Japanese fighter though just how much talent is the real question.